Leadership Texarkana: Great things to come…. Leadership Texarkana: Remember that name because this exciting new program of the Texarkana Chamber of Commerce is destined to have a far-reaching impact on the future of Texarkana. Community leaders - effective ones - do not suddenly appear to take up the challenge and step into cadence. ...Seldom, without training and exposure to other organizations and community activities, do they really see and understand the over-all picture of community needs. That can come only from listening, learning and participating. That is the purpose of LEADERSHIP TEXARKANA: to give interested men and women with leadership potential the opportunity to develop their knowledge, and to hone the skills of leadership through a planned learning process in the atmosphere of the community itself. In this living laboratory, LEADERSHIP TEXARKANA will bring together persons from all areas of the city’s life for sharing, learning and participation. When they have completed the course, they will be familiar with all aspects of Texarkana life, and will be better prepared to lead and work together for all of us. In the '70s, communities across the U.S. realized that with increased population mobility and heterogeneity, community residents weren't stepping up for leadership positions where they lived. In response, communities began developing Community Leadership Development programs--like Leadership Texarkana--to cultivate leaders for their communities. The National Association of Community Leadership Organizations is the national affiliate. Leadership Texarkana has succeeded due to decades of ongoing commitment and support of community and business leaders, leaders who annually have nominated, supported and encouraged employees and fellow citizens to take part in Leadership Texarkana, recognizing that the key to raising up any community it to raise up its leaders. 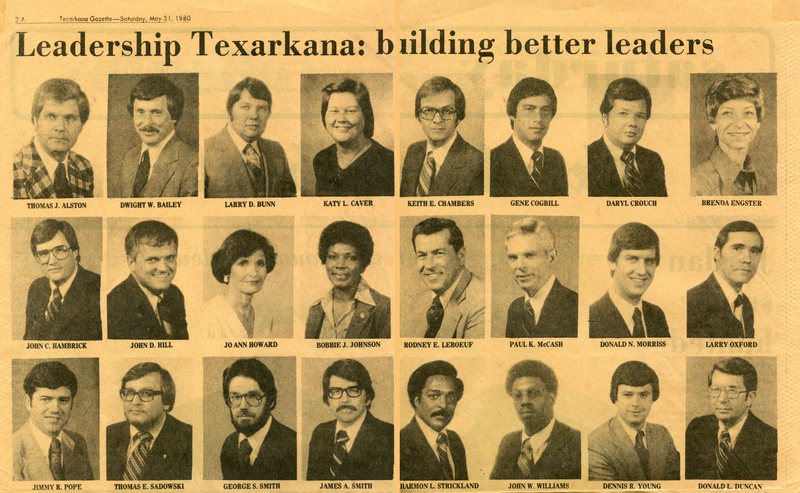 Phase 1: 1978-1992 - Texarkana Chamber of Commerce establishes Leadership Texarkana. Phase 2: 1992-2001 - Leadership Texarkana Alumni Association organizes for action. Phase 3: 2001-2010 - Leadership Texarkana becomes an independent all-volunteer organization. Phase 4: 2010-present - Leadership Texarkana restructures with resources for progress and impact.